It is clear that Detroit today is designing automobiles for style, cost, performance and calculated obsolescence, but not for safety. 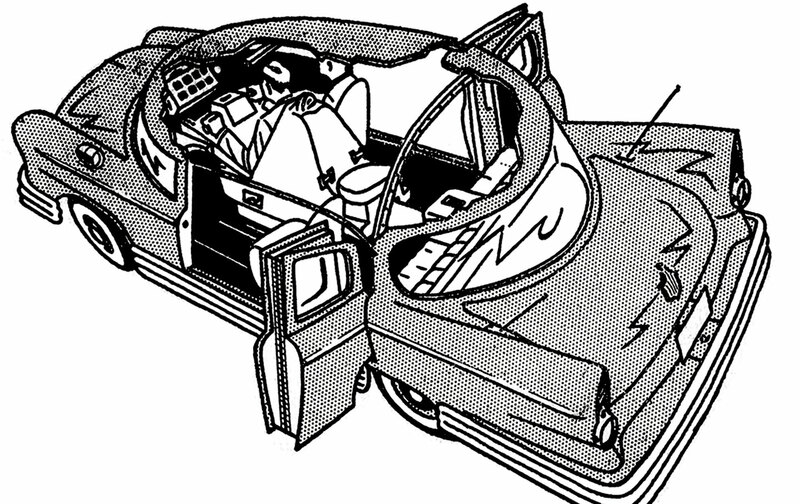 Doors that fly open on impact, inadequately secured seats, the sharp-edged rearview mirror, pointed knobs on instrument panel and doors, flying glass, the overhead structure—all illustrate the lethal potential of poor design. A sudden deceleration turns a steering wheel or a sharp-edged dashboard into a bone- and chest-crushing agent. Penetration of the shatterproof windshield can chisel one’s head into fractions. The apparently harmless glove-compartment door has been known to unlatch under impact and guillotine a child. Automobiles are so designed as to be dangerous at any speed. Our preoccupation has been with the cause of accidents seen in terms of the driver and not with the instruments that produce the injuries. Erratic driving will always be characteristic of the traffic scene; exhortation and stricter law enforcement have at best a limited effect. Much more significant for saving life is the application of engineering remedies to minimize the lethal effects of human error by designing the automobile so as to afford maximum protection to occupants in the event of a collision. In a word, the job is to make accidents safe. The task of publicizing the relation between automotive design and highway casualties is fraught with difficulties. The press, radio and television are not likely to undertake this task in terms of industry responsibility when millions in advertising dollars are being poured into their coffers. Private researchers are reluctant to stray from their scholarly and experimental pursuits, especially when cordial relations with the industry are necessary for the continuation of their projects. The industry’s policy is bearing fruit; most investigators keep their private disgust with the industry’s immobility from seeping into the public limelight. They consider themselves fact-finders and leave the value judgments to others. This adherence to a rigid division of labor provides a convenient rationalization for the widespread amorality among our scholarly elite, who appear insensitive to the increased responsibility as citizens which their superior knowledge should require them to shoulder. Even if all the facts, laid before the public, did not increase consumer demand for safety design (which is unlikely), the manufacturers should not be relieved of their responsibility. Innumerable precedents show that the consumer must be protected from his own indiscretion and vanity. Dangerous drugs cannot be dispensed without a licensed physician’s prescription; meat must pass federal inspection before distribution; railroads and other interstate carriers are required to meet safety standards regarding their equipment. Just one year out of Harvard Law School, Ralph Nader published this article on car safety in the pages of The Nation, later expanding his ideas into his first book, Unsafe at Any Speed (1965), which helped launch the consumer-rights movement.